Does everyone have been nice to others ? We do not doubt it ... So do not waste time to start preparing your Christmas gifts list. Easier than cutting out pictures of gifts in catalogs and paste them on your sheet, Ookoodoo allows you to fill your gift list with only one click.Drag and drop our button to add product in the bookmarks bar of your browser and fill your list over to your desires. This is certainly the most asked question before Christmas. This year, you can answer without hesitation, "I put everything on my Ookoodoo Christmas list." Our gift lists are, easy to create, free, and give you the opportunity to choose exactly the products you want from any store and any and brands available! Once your Christmas gift list is ready, you just have to share it with your friends by email or via social networks. They will be then able to access your wish list and book products. 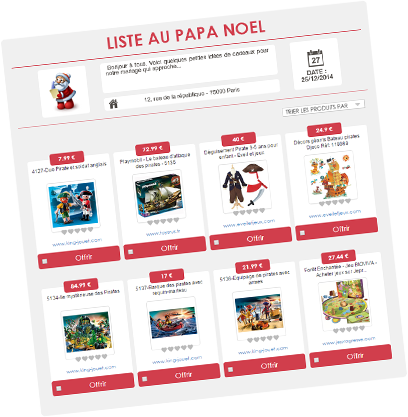 For those who do not have any gift ideas, Christmas list is the best way to help them and guide them in their purchases and receive gifts that will please you!